In this tutorial we will be introducing XML which is designed to describe data unlike HTML which was designed to display data. XML Stands for EXtensible Mark-up Language (XML). XML is the Universal format for Structuring Documents and Data on the Web. Actually Extensible Mark-up Language is not a mark-up language , but a set of rules for creating a new mark-up language. XML is a Subset of Standard Generalized Mark-up Language (SGML). SGML specifies the Rules for Creating Mark-up Languages. The XML 1.0 was made a World Wide Web Consortium (W3C) recommendation on February 10, 1998. A typical XML structure looks Similar to HTML code. As shown in the above example, we can see XML structure is like HTML structure. 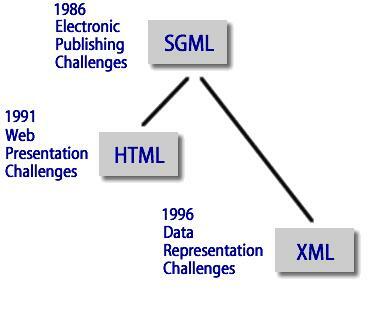 XML is represented using hierarchical or tree like structure. XML tree consists of the tags like HTML but tags defined are not pre-defined. Some of the pre-defined tags used in HTML are strong,body,head,title. XML is not used to render web pages , It is used to transfer and represent data using tags. In the above XML file we are transferring address information of two persons. XML is replacement of HTML ?